LG working on foldable phone that doubles as a tablet | What Hi-Fi? No stranger to crazy screens, it looks like an LG foldable display is nearing production. LG and Samsung have battled to outdo each other when it comes to TV and phone technology in recent years, and we've seen some interesting concepts as a result - from bendable screens (see video, below) and rollable TVs, to flexible phones like the G Flex 2. Now it looks like we can add folding phones that double as a tablet into the mix. Samsung's folding phone was teased earlier this year, and LG seems to have a similar design in the works. A shape-shifting phone would allow you to fold the screen out flat in order to make a tablet-sized device. Naturally, this technology could be rolled out to larger screen sizes, potentially including TVs. LG Display is said to be working on moving its latest generation plastic OLED screens into full production, which would pave the way for more elaborate and inventive displays and devices. 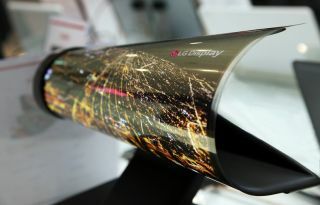 Last year, LG revealed a 'Wallpaper TV' that was just 0.97mm thick. A flexible display meant that it could be hung on a wall, and be peeled off too.